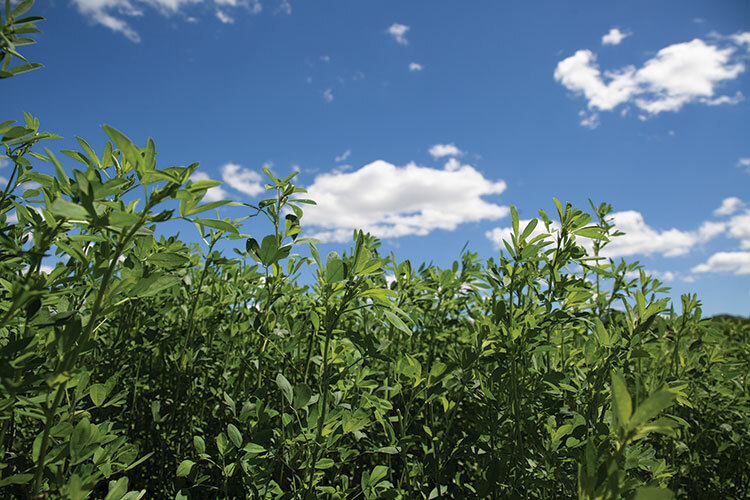 Reduced-lignin alfalfa introduces flexibility into harvest by allowing a seven to 10 day delay while still maintaining acceptable forage quality. A delayed harvest may also reduce the number of cuts needed per year and the amount of traffic in the field. “We’re going to cause damage, we don’t harvest with a helicopter,” explained another conference speaker, Ev Thomas, who is president of Oak Point Agronomics in Hammond, N.Y. Repeatedly harvesting at the bud stage exhausts stands. “Frequent harvest has a negative impact on the rhizobial nodules in the plant and even on the root hairs,” Thomas explained. But, delaying harvest allows more time for plants to restore root carbohydrates. With a schedule that involves three or more cuttings, every plant in the field will be run over at least once, which results in crown damage. Damage makes a plant more susceptible to disease and lessens its ability to retain water. A study conducted by the University of Wisconsin found that there was an improvement of 15 to 20 percent in yield for three cuttings versus four cuttings. Some of this was attributed to less traffic. By delaying harvest to the bud stage, alfalfa-grass becomes a possibility. “A combination of meadow fescue and reduced-lignin alfalfa harvested at the bud stage can result in excellent forage quality,” Thomas indicated. Thomas also assured that if a producer normally harvests alfalfa at the bud stage, doing so with an alfalfa-grass stand will not impose a change into the producer’s regular schedule. alfalfa-grass is that grass matures faster than alfalfa, the benefits are hard to ignore. To start, a higher milk production potential is also seen when comparing alfalfa-grass to straight alfalfa. Alfalfa-grass has also been known to out-yield stands of straight alfalfa. Thomas doesn’t recommend going “all-in” with reduced-lignin alfalfa. “Seed a portion of the alfalfa acreage to reduced-lignin alfalfa or alfalfa-grass, and choose your best alfalfa land,” advised Thomas. “If you go to a seven to 10 day delay and get a better recovery of root reserves, you may find that you’re going to be able to get at least an extra year on your alfalfa stand,” he explained. When it’s time for harvest, Thomas advised to cut alfalfa-grass first followed by conventional alfalfa and then reduced-lignin alfalfa. “The goal is to have as close to ideal forage quality from the first harvest until the last,” explained Thomas. This strategy is the best accommodation since grass matures quickly, and reduced-lignin alfalfa quality isn’t compromised with a delay. From his 15 years of experience working with BMR corn, Thomas has learned a thing or two. At the top of the list is to plant BMR on your best corn ground. “BMR hates ‘dry feet,’” Thomas specified. “BMR just doesn’t like to get dry.” While a yield drag of 10 to 15 percent is still to be expected, avoid thin, drought-prone soils to prevent further yield loss. If you desire a “good looking” crop, you best look elsewhere. “BMR isn’t pretty. If you care what the boys at the coffee shop say, plant the guard rows to a leafy hybrid. Then they’ll think the whole field looks that way,” Thomas said with a grin. Because of the reduced-lignin content, the cell walls in BMR corn are more fragile. To compensate, a longer chopping length might be needed to get sufficient physically effective fiber. Cows need to spend a certain amount of time chewing their cud to maintain optimum rumen function, so feed a high percentage of forage when feeding BMR corn. Several chewing studies have been done that compare BMR to conventional corn silage. Cows that ate BMR consumed more silage and spent less time ruminating per pound of NDF consumed. Also, cows spent 5 to 10 less minutes eating, which adds up to about 30 minutes less spent eating per day. This allows for more resting time. In order to see a milk yield response, Thomas noted that the total ration must consist of at least 20 percent BMR on a dry matter basis. Optimally, the ration needs to be 30 percent or more BMR. “When fed at the right rate to the right cows, BMR should result in 3 to 5 pounds in milk response,” Thomas detailed. “That 3 pounds of milk will pay for a 20 percent yield drag,” he added. Can half of the field be planted BMR and half conventional to make up for the BMR yield drag? Thomas also recommended that if BMR inventory is low, withhold BMR completely during the winter and feed it during the heat of summer. The high digestibility of BMR will help maintain production in cows experiencing heat stress. “Measuring BMR on wet tons per acre is a very poor leading metric indicator,” stated Barmore. “Think about it. Why did we plant it at the beginning? It wasn’t for tons; it’s got a yield drag. We planted it for digestible fiber. So, shouldn’t we measure the yield in potentially digestible fiber versus wet tons? It’s going to lose the wet ton contest,” he added. Barmore recommends focusing on the conceptual flow where wet tons start out on top and filter down (see table). “When you get to NDF, NDF digestibility, uNDF (undigestible NDF), and pdNDF (potentially digestible NDF), you get it to a point where it can be expressed on a potential yield basis of digestible fiber. That’s the way I think we need to be looking at BMR. When you do that, it really starts to tell the story,” he explains. Is there such a thing as too much high-quality forage? What if reduced-lignin alfalfa and BMR corn silage are both being used? Is it going to cause any problems with rumen health? “It could, but I think that would be an exception if you were on top of your game,” Barmore said. He further explained that any possible issues might be attributed to other factors such as cow comfort, feeding management and consistency, proper processing, and chopping length. This article appeared in the November 2018 issue of Grower on page 30.